Sprawled on the Cape Aspro Ridge high above the glittering blue sea stands Pissouri, a village where time stands still. The quintessential seaside retreat, it is far removed from the madding crowds of tourists that flood resort towns like Limassol and Paphos during the summer, and in spite of being popular with tourists, it still retains her authentic Cypriot character. Perfect for couples seeking secluded romance or families looking for a beautiful seaside holiday, you will find yourself lost in this scenic paradise. Teeming with tavernas and pizzerias, watersports and Blue Flag beaches, it is truly one of Cyprus' best-kept secrets, and it is overlooking these beaches that you will find some of the best places to stay in Pissouri. The best way of understanding anything is to hear it from the horse's mouth. Pissouri is no exception. A common phrase used by locals is "another perfect day in paradise", and it is easy to see why. The valley between the scintillating blue sea and the main road sweeps with lush vineyards; from the crest of the Cape Aspro Ridge you can see the snowcapped peak of Mount Olympus; to the east lie countless citrus orchards; to the west, you can see Aphrodite's Rock being swallowed by the sea. While the tourism industry has boomed in the past few decades, the majority of Pissouri's locale are farmers who labour in the surrounding fields. The best way to experience this unspoilt beauty is to hire a bike and cycle down the snaking, bumpy roads and drink in the scenery. The village itself is picture-perfect. Authentically Cypriot, the village is divided between Pissouri Beach and the village, which stands on the ridge. The main square, roughly 3km from the beach, brims full of charming tavernas, cute cafes, bars and pizzerias: in the evening, particularly during the summer, the locals congregate in the main square and the quiet streets come alive in a haze of music and dancing. The beach area is delightful: part shingle, part sand, the beaches have all been awarded the Blue Flag, and offer everything from waterskiing to boat hire. Pissouri also has a secret beach, which is wonderfully secluded and is ideal for sunbathing with a good book. In 2000 an amphitheatre was opened, with Shakespearean plays and Hungarian dancing being on the billing in recent years. Visit the historic Gothic church in the village for a bit of respite. Head down to the beach and sunbathe in the peace and quiet with a good book. Go waterskiing, kayaking, sailing or jet-skiing! Check out the amphitheatre, particularly during the summer, and take in a play. Get yourself to Aphrodite Hills Golf Club for a round or two. Wander out west to Aphrodite's Rock, the supposed birthplace of the ancient Greek goddess of love. Dive amongst shipwrecks with the Pissouri Bay Divers! This is a picturesque and unsurprisingly popular free spot so to ensure a space at one of the best places to stay in Pissouri we recommend planning your trip well in advance. Colombia Beach Resort: ideal for families or couples, this amazing resort is at the mouth of the Bay. 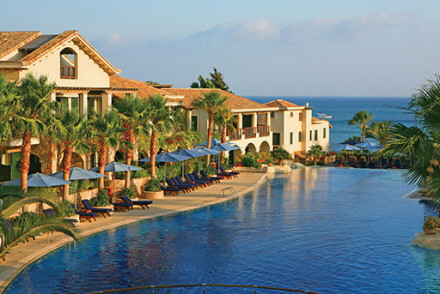 Full of stunning suites, a spoiling spa, restaurants and bars, it promises to submerge guests in a sea of tranquillity. The best time to go is during the autumn when the weather is clement (between 14 and 28 degrees) without being overly hot like it is during the summer. Fly to Larnaca International Airport, 60 miles from Pissouri Bay. Then catch a bus to Limassol, from where you can catch a bus to Pissouri. Browse through our collection at nearby Limassol. A stunning bay front beach resort with beautiful suites, restaurants, spa, enormous pool and private beach. Tasteful suites and family suites have wooden furniture, stone floors, private balconies and all the mod cons. Romantic, but still family friendly (kids club), and perfect for a beach holiday.